They’re devoted to their practice, delighting in every opportunity to help clients craft healthful lifestyles. They promote nutritious eating and the role of the RD in the community. They’re always eager to tackle new challenges. They truly exemplify what it means to be an RD. 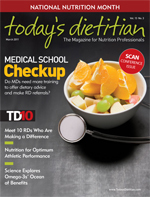 To honor National Nutrition Month, we asked readers to nominate such deserving RDs, detailing the ways in which they inspire their colleagues and clients. This article spotlights 10 individuals chosen for their accomplishments and dedication to the field. Enjoy these peer profiles—and give yourself a pat on the back for the wonderful work you do every day. Pediatric obesity is a top concern for many healthcare professionals, teachers, and child psychologists. Tracy Bryars is one individual who has been instrumental in helping fight childhood obesity by establishing a program called Healthy For Life that addresses the rising trends in obesity through its school-based intervention model. Bryars’ love of “all things nutrition” evolved during her high school years, when she found herself gaining weight. “I had put on 15 lbs over my sophomore year and went on a crazy diet, losing the excess weight. I decided at that time I wanted to learn how to eat health[fully] and avoid gaining the extra weight in the future,” she says. As a senior, Bryars became interested in science and soon recognized that the combination of wanting to help others eat healthfully and her love of science would lead her on a journey toward becoming an RD. Today, as manager of the Healthy For Life program, Bryars manages existing Healthy For Life school sites, organizes teacher trainings, and conducts program assessments and evaluations to facilitate quality improvement for the school-based childhood obesity prevention program. Bryars coordinated and directed the program’s growth from 12 classes in 2007 to 127 classes in more than 90 Orange County Schools by 2010. Bryars has found it extremely rewarding to see the thousands of children, adolescents, and parents improve their lifestyle. So far, the behavior changes from the Healthy For Life program have resulted in students’ BMI percentiles decreasing to a more healthful range and a reversal of some identified medical concerns, such as prediabetes and hypertension. Dietetics may be Debbie Petitpain’s second career, but it’s her first love. Having originally worked in a lab as a chemist for four years after college, she always had an inclination for using food to promote health. At that time, Petitpain was also motivated to avoid the struggles with heart disease that plagued her father and simply wanted to inspire other people to be healthy through a “medicine” they were already taking every day: food. “My daily goal is still to help people move toward a general sense of well-being by making healthy choices about their diet, exercise, lifestyle, or wherever they want to start,” she says. Presently, Petitpain is employed by Sodexo and works full time for the bariatric surgery program at the Medical University of South Carolina (MUSC) along with another full-time RD, a physician assistant, a program manager, a patient coordinator, and four surgeons. With her RD counterpart, she helps patients move along the continuum of good health at every point in their journey to, through, and beyond surgery. Because MUSC is a teaching hospital, Petitpain also provides mentoring to dietetic interns and up-and-coming health practitioners, including medical and nursing students. Kelly Urbanik graduated from the University of Florida with a bachelor of science degree in food and human nutrition, with a specialization in dietetics and a minor in business. She completed her dietetic internship in Orlando, Fla., through Andrews University in Berrien Springs, Mich., where she discovered her love of pediatrics. Currently, Urbanik works as a specialty clinical dietitian at Arnold Palmer Hospital for Children. “I am the lead ketogenic dietitian for the Arnold Palmer Ketogenic Diet [KD] program,” she says. “I am in charge of the nutrition portion of our KD program, which involves initiating patients on the diet during a three- to four-day hospital admission and then following them on an outpatient basis for the duration of their therapy.” Urbanik typically follows approximately 50 KD outpatients. Urbanik has been a key leader in working to establish central Florida’s KD program. In fact, she has been working tirelessly, developing relationships with several neurology practices, providing their staff with educational information about the diet. But her outreach doesn’t end there. Urbanik has worked with hospital pharmacy and nursing departments to establish hypoglycemia protocols and medication administration guidelines for patients on the KD program. Urbanik’s core focus is on the well-being of her patients, evident in her constant attention to their needs and her willingness to be contacted all hours of the day and night to answer questions from parents or medical staff. This “patient-first” approach is further evident in her effort to organize the first annual epilepsy awareness walk in Orlando. When Diana Dyer graduated from college with a degree in biology, she found herself working as a lab technician, cutting the eyes off fruit flies for a professor who was doing ophthalmology research. She soon realized that she couldn’t imagine doing that for the rest of her working life. Having taken an undergraduate introductory course in nutrition, she decided to start a PhD program in nutritional sciences. “I saw how everything I had learned about chemistry and biology had a true human application through the science of nutrition,” Dyer says. She completed her undergraduate degree at Purdue University, her dietetic internship at the University of Wisconsin Hospital, and her master’s degree in nutritional sciences at the University of Wisconsin-Madison. After spending the first 20 years of her career in clinical positions, Dyer has continued her RD role, wearing many hats. In 1997, she began a private practice, focusing solely on providing nutritional guidance to cancer survivors. At the same time, she published A Dietitian’s Cancer Story and established the Diana Dyer Cancer Survivors’ Nutrition and Cancer Research Endowment in 1999 at the American Institute for Cancer Research. Long-term and multiple-time cancer survivor and tireless advocate and ambassador for oncology dietitians, Dyer has been elected to the Oncology Nutrition Dietetic Practice Group’s executive board and received its Distinguished Practice Award in 2005. For the past eight years, Amy Jones has been the chief clinical dietitian at Mary Rutan Hospital, a small community hospital in Bellefontaine, Ohio. Because of the hospital’s small size, Jones has enjoyed a wide variety of experiences, with tremendous support from her boss and hospital administration. Jones has a bachelor’s degree in dietetics from West Virginia Wesleyan College and a master’s degree in nutrition from Ball State University. She interned through Ball State at Parkview Hospital in Fort Wayne, Ind. Last year, Jones took her biggest leap in starting and facilitating a support group for those with celiac disease, inspired in part by a friend’s young daughter. Over the next four months, Jones studied every book on celiac disease that she could get her hands on. She met with Mary Sharrett, a nationally recognized dietitian expert at Nationwide Children’s Hospital in Columbus, and scheduled her first support group meeting for May 2010. She hoped a few people would come and show the hospital that the group was worth the time and effort she was putting into it. “My first meeting drew 45 people, far exceeding my wildest dreams, expectations, and the capacity of the room,” Jones says. “We have continued to meet monthly, with a different topic discussed each month, as well as product sampling and social time. “I went to college to study nursing and transitioned to nutrition because I observed that food was a powerful tool in healing and there needed to be more focus on food as medicine,” she says. Swift obtained her bachelor’s degree in food and nutrition at the State University of New York, Plattsburgh, and her master’s degree in nutrition at Arizona State University. Much of her nutritional medicine schooling was obtained through course work and seminars in which she enrolled both in the United States and the United Kingdom in the 1980s. “I actively pursued continuing education because I was hungry for knowledge in topics such as detoxification, herbal medicine, energy healing, and dietary supplements that my formal education did not provide,” she says. Currently, Swift enjoys many different roles in multiple settings. “This affords me the opportunity to interact with extraordinary, dynamic individuals who share my passion for nutritional medicine,” Swift says. Her functional medicine practice includes her private practice, SwiftNutrition, as well as the UltraWellnessCenter in Lenox, Mass. She is also the chief nutrition advisor for and creator of www.myfoodmyhealth.com and www.myfoundationdiet.com. Integrative and functional medicine have been passions of Swift’s since the early 1980s, when she was determining how to better manage a chronic health condition. Swift’s hope is that dietitians become advocates for clean, sustainable food systems and that they expand their skills in integrative and functional medicine so they can help heal the suffering of so many with chronic disease through the power of truly good food as medicine. Although truly successful in her career as an RD, Joyce Diacopoulos did not originally set out to be one. Rather, she began her freshmen year of college as a chemistry major. Diacopoulos changed majors and completed her bachelor’s degree in food and nutrition at West Virginia University. After graduation, she started a dietetic internship at Good Samaritan Hospital in Cincinnati, Ohio. “My current role at the Hillman Cancer Center, which is the headquarters of the University of Pittsburgh Cancer Institute, is to provide nutrition care to our patients prior to surgery or after, to guide them with nutrition tips during chemotherapy and radiation, and to be their nutrition ally in their fight against cancer,” she says. Diacopoulos makes patients her top priority by routinely manipulating her schedule to be available to all patients that the Hillman Cancer Center serves. She frequently stays late to see patients past her scheduled shift. Diacopoulos participates in the cancer research being conducted at the Hillman Cancer Center, which includes a nutrition component, in an effort to advance the care that cancer patients receive. As an active member of the American Dietetic Association’s (ADA) Oncology Nutrition Dietetic Practice Group, she was one of the first dietitians in the area to receive the ADA’s nutrition credentials as a certified specialist in oncology. As the assistant director of nutrition services at Patton State Hospital, a 1,500-bed major forensic mental hospital operated by the California Department of Mental Health, Brian Starck-Riley oversees the nutrition care of his patients, which includes overseeing a team of RDs, dietetic technicians, and dietetic interns while they are on their clinical rotation. Patton’s patients range in age from 17 to 80 and older and come with various medical conditions, such as HIV; hepatitis A, B, or C; end-stage liver disease; end-stage kidney disease (predialysis and postdialysis); wounds; and metabolic syndrome. “Most notably, due to the side effects of psychotropic medications in this population group, is the overweight and obesity population, which is estimated to be greater than 80% of our patients, with an estimated diabetes rate of greater than 20%,” Starck-Riley says. As part of his role, Starck-Riley assisted in the development and coordination of the hospitalwide diabetes management team. In addition, he developed and coordinated the nutrition student volunteer program, which has provided experiences for 15 student volunteers in less than two years. He also developed a heart-healthy diet program for all 1,500-plus patients. And he assisted in the development and coordination of the Rehabilitation Management Committee focusing on dysphagia and wound care. Being able to promote, understand, and increase the awareness in others that nutrition is the foundation of all health was the driving force behind Starck-Riley’s decision to become an RD. “My goal with my patients is to increase the benefits of healthy eating, improve awareness of health risks, and increase their knowledge so they have the ability to make their own decisions and take ownership of their health,” he says. “I want my patients to realize the power of nutrition in preventing and treating major illnesses. As a teenager, Peggy Redfern was an avid swimmer and became a lifeguard and swimming instructor at a local pool. At that point, she began to see the relationship between nutrition, overall health, strength, and endurance. The rest, as they say, is history. Prior to her role at WIC, Redfern was instrumental in numerous areas in the field of dietetics/nutrition services. She worked as a clinical dietitian and a foodservice manager in various hospitals, at a retirement community, at a private boys’ school, at a college, and even at a Boy Scouts camp. She also shared her expertise as a hospital foodservice director and a corporate dietitian for a foodservice management company. While working as a corporate dietitian, she oversaw 20 facilities. Currently, Redfern manages nine WIC clinics in a rural area of California’s Central Valley, serving a monthly caseload of more than 30,000 participants. She has a staff of 12 dietitians and 65 paraprofessionals. McDowell was fortunate to complete her dietetic internship at the University of Medicine and Dentistry of New Jersey, which provided an excellent clinical foundation through various rotations in New York City and New Jersey. She then finished her master’s degree and successfully passed the nutrition support board certification exam. After returning home from the East Coast, McDowell accepted two positions: a full-time ICU nutrition support dietitian at St. John Hospital in Detroit and a part-time wellness educator for Henry Ford Health System. After working three jobs simultaneously for many years, McDowell decided to take a position in Ann Arbor, Mich., as the director of nutrition at Saint Joseph Mercy Health System. “Working at St. Joseph Mercy Hospital has allowed me to grow in ways I could never have predicted,” she says. “I continue to have patient care responsibility, and I also lead a team of the most talented RDs you could ever meet. My role allows me to participate in research, publish, teach our interns, and partner with the University of Michigan to lecture at the medical school.